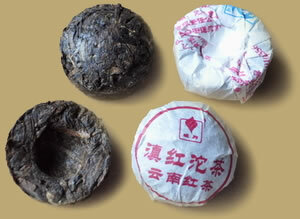 This Black Tuocha was processed by high quality Yunnan Black tea (Dianhong), individually compressed and wrapped single serving. The tea has a smooth, full-bodied and rich flavor, you can add a slice of lemon, a mint leaf or some honey to taste. A convenient and rewarding way to enjoy Yunnan Black tea. PREPARATION: To prepare Mini Tuocha tea, place one in a teapot. Rinse by covering with boiling water and quickly pour off. Cover with boiling water again and let steep 5-30 seconds (depending on how light or dark you want the tea) and serve. After the first infusion the tea has just gotten started so keep on infusing. Black tea can be steeped 3-5 times.